Rupen Patel, CEO of Influence Health, talks about a number of ways in which hospitals, health systems, and providers can both attract and retain patients by creating an Amazon-like personal and on-demand experience healthcare consumers have come to expect. He shares case examples of how traditional marketing practices are now being used at the clinical level as providers are seeking ways in which to adapt their customer relationship management (CRM) solution into a clinical tool that enables continuity of care, improves satisfaction scores and reduces readmissions. Rupen Patel is the CEO of Influence Health. In addition to overseeing the organization’s strategy and operations, he has played an integral role in shaping the vision and technology agenda to Influence Health’s consumer experience platform. Neal Howard: Welcome to this Health Supplier Segment here on Health Professional Radio, I’m your host Neal Howard. We’re going to have a conversation with Mr. Rupen Patel, CEO of Influence Health. He’s going to talk with us today about a number of ways in which hospitals, health systems and providers can both attract and retain patients by creating what he calls an Amazon like, personal, and kind of an on-demand experience in healthcare. Welcome to the program. Rupen Patel: Thank you, glad to be here. Neal: Other than being the CEO of Influence Health, give our listeners a little background about yourself and then jump right in and talk about being CEO of Influence Health. When was it founded and what does Influence Health involve themselves in and how do they help these health systems attract and retain patients? Rupen: Great, yeah. 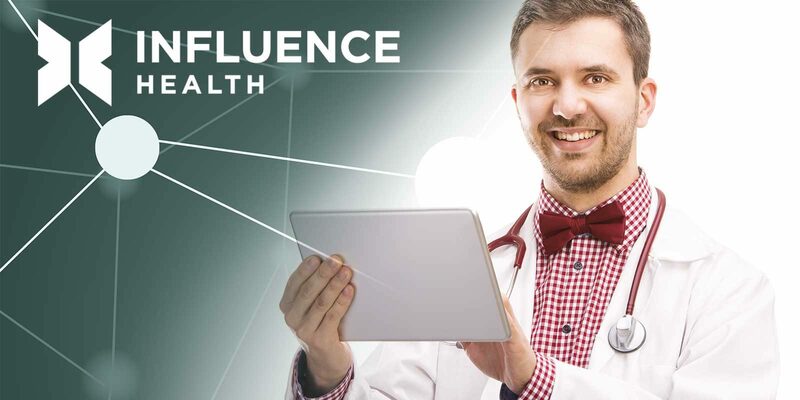 So a little bit about Influence Health, we were founded right around the time that the internet became popular over 20 years ago and we essentially help health systems and hospitals get online and have really good connection with consumers starting right around that beginning the internet era. Since then, we’ve evolved. We’ve added multiple solutions to our sort of stack beyond just the content management system that we started with, going all the way into predictive modeling, data analytics as well as consumer outreach and education. So the company’s evolved quite a bit, we became Influence Health about six years ago after a couple of different acquisitions and I’ve been with the company about two years, originally started as the CTO and moved into CEO role earlier this year. Neal: Let’s talk about this term that I’d mentioned early on ‘healthcare consumerism.’ What is healthcare consumerism and how does it differ I guess from any type of other consumerism? Rupen: It’s a great question. In a way, it doesn’t. If you think about it from multiple vertical industry point of view, industry such as banking and retail went through a transformation many years ago where they were focused on their internal profits and optimizing those and instead sort of shifted to making sure they could acquire the consumer in the right time, the right place with the right message is led to things like ATMs and mobile banking applications and online portals and easy access to all kinds of banking services wherever you need it. The same thing happened with retail and hospitality many years ago. And so all of us as consumers of services out there have certain expectations today. Whether it’s quickly I can get a ride, I just push a button on Uber and get it, how quickly I can order something online and have it shipped to my house. And those expectations are now set because the majority of system services, providers we interact with provide that level of digitally enabled services. What’s a little different is healthcare is essentially a few years behind, so healthcare is still to a large extent focused on the provider experience and the experience you get inside of the four walls of a provider organization. And so what we’re saying here with healthcare consumerism and the rise of it is that we’re taking a lot of the learnings and a lot of the sort of benefits of consumerism from other industries and starting to apply it in healthcare to make healthcare more transparent, accessible, efficient, etc. And ultimately outcomes matter, right, so you go into the healthcare system and see a provider to get a better outcome and that’s still going to be top of mind but we can’t ignore the other aspects of how consumers interact with its services today and the expectations consumers have. Neal: So how do you dig deeper into that and connecting on an even more personal level? Rupen: Well again, there’s a lot of good examples out there in the industry. So if I’m a consumer and I’m curious about some condition or some problem I’m experiencing, the first thing I’m going to do is go and search online and so over seventy seven percent of consumers like you and I start with a search engine experience when we’re trying to figure out what’s wrong with us or if we actually have something wrong with us. And so it’s really important just right the outset and there’s so much demand for search related information to make sure that the provider organization has a good digital footprint that’s going to show up in those search results and be responsive to what folks are searching for. Otherwise, those services will never get found. Along with search, most of us will kind of go and look at ratings or reviews of things online and this includes providers today and so another big aspect of this is making sure that the ratings and reviews are aligned with the true capabilities of the organization, the right providers are listed, all the specialties are listed, everything is taken care of. So I’d say that’s sort of table sticks, sort of have to have that basic digital footprint. Beyond that, all of us soon as we go and ask our friends and so there’s a whole aspect of social engagement and social information sharing and so it’s important for a healthcare organization to have a very robust social footprint so that when consumers ask for advice and things like that, the people who respond will often refer them to somebody. And so if you had a good social footprint, you’re likely to get more traffic that way as a healthcare organization. Last but not least, that’s where the I say basics of being a digital citizen. When consumers today want to consume healthcare services, they don’t really want to spend two hours of their day trying to figure out how to make appointment and then show up and wait another two hours and have a 15-minute appointment and then sort of just be forgotten about. And so there’s a whole set of things you can have after the consumers found the provider they want to interact with, that include easing the ability to make appointments whether it’s a healthcare provider calling since we’re back with a call center and making the appointment for them or consumer being able to do it online. All those seems producing the friction and then of course there’s the in-provider experience which is actually getting better, there’s been a lot of attention paid to that over the last few years, creating somewhat a hotel like experience inside of the organisation. But then after after we leave the provider’s four walls, what happens? Do we get appropriate follow-up to get information that will lead us to not having to be readmitted, let’s say after a complex procedure like a surgery? And is that happening effectively? So there’s a bunch of touch points that really start before the experience, during the experience and then after the experience and we think when we talk about consumers and it really means all of those. It doesn’t just mean covering the in-patient or in-provider experience. Neal: As consumers, we can be extremely fickle. How does Influence Health deal with the highly competitive nature of these, of having a good digital footprint, a good social footprint especially online, in the cloud and all of the other places where you have to have some influence there once someone discovers how well you’re doing? Aren’t they going to cookie cut your procedures and concepts? How does Influence Health get around the highly competitive nature of the landscape? Rupen: Yeah, that’s a great question. And actually it’s a really good reason to have a company that’s focused on this, right. So the health care provider organizations are focused on delivering good healthcare, they’re not necessarily focused on keeping up with all the evolution of digital channels that emerge. Our company Influence Health, we’re an omni-channel company and so we’re always looking ahead. Is the traffic moving over to Instagram? Is it moving over to Yahoo or Facebook or Google? Where is it going? And to based on where the traffic is going, we’re constantly evolving our offerings to support those new channels so that’s just in a general sense. Our company’s marching orders are always to stay on top of every channel where consumers are going to be and that’s the reason why it makes sense to have that as a specialty rather than try to have everybody, the experts, at omni-channel engagement. The second part of that, I’ll say is healthcare is a very local and a very highly segmented business and so what I mean by that is that sometimes the channel that works to attract consumers, say, in a rural area are going to be different than say a city block that maybe has a lot of apartment buildings. So how you reach those consumers, whether it’s the outdoor advertising, radio, television, internet or mailers or social ads, it’s all going to vary based on who you’re targeting. And then the second dimension is what is the actual situation that the consumer have? So the condition or the state that they’re in. Is it a chronic condition? Isn’t something quick, just cold and flu season? And depending on what those are, you’re going to target them differently and you’re going to provide different levels of service. We have some provider organizations, for instance, in urban areas who’ve chosen to buy retail … outlets and so they basically provide all of these fixed services like flu shots and things like that in those facilities and somebody to be walking down the sidewalk, get a pain, can walk in and get their flu shot. So it just varies and that’s why I think you have to have an organization it’s really focused on segmenting appropriately, doing location specific targeting as well as making sure that it’s on the channel, available. Neal: In wrapping up Ruben, give us a website where we can learn more about Influence Health. Neal: Thank you so much for joining us here on this Health Supplier Segment, Rupen Patel, CEO of Influence Health. It’s been a pleasure. Rupen: Thank you. It’s been a pleasure as well.